Dates and location, including accommodation, have now been finalised for 3ma-2008. Friday 16th to Monday 19th of May 2008 are the dates to mark in your diaries and head to Scotland for 3ma-2008. Plans are progressing steadily and while we have not yet finalised our driving routes we expect to stretch from our chosen base in Inveraray, the Argyll region's former Royal Burgh in Western Scotland, to the mountainous Highlands discovering a land of lochs, mountains, history and much more. 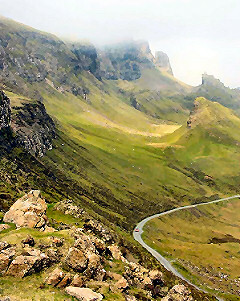 We look forward to testing cars and drivers on roads like the Inverfarigaig Corkscrew, the aptly named road built in 1815, which twists up deep into the wild by the side of Loch Ness and is more difficult to drive than to say! We’ll be able to drive the tightest and steepest set of hairpins you can imagine where most have to do three-point turns while we’ll probably just use power oversteer! 3ma-2008 will have the same theme as in 2007 which is a lot of driving fun as well as plenty of time to socialise, meet up with old friends as well as make new ones. We have chosen the Loch Fyne Hotel & Spa in Inveraray Scotland for our accommodation during the 3ma in 2008. A special all inclusive deal has been negotiated at £65 per night per person inclusive of dinner, bed and breakfast. 3ma guests staying at the Loch Fyne Hotel & Spa will have access to the swimming pool, sauna, steam room and outdoor hot tub at no extra charge. The hotel's Spa also offers a number of massage and beauty treatments so attending family members can stay at the hotel to be pampered and relax while the 131 drivers go driving around Scotland! We have reserved several rooms at the Loch Fyne Hotel & Spa and these will be held for us until February 2008. But it is important to book your rooms early so we can reserve more rooms if needed. Alternative accommodation in the area is very limited so please book early to avoid disappointment. We also expect to arrange ferry discounts for our Continental and Irish friends. Details can be found on the Trav & Acc (Travel and Accommodation) section of the website at www.131mirafiori.com. We are looking forward to meeting all our friends from the last 3ma and looking forward to making lots of new 3ma friends at 3ma08. If you are joining us for the 3ma in 2008 please complete the 3ma08 Registration form.